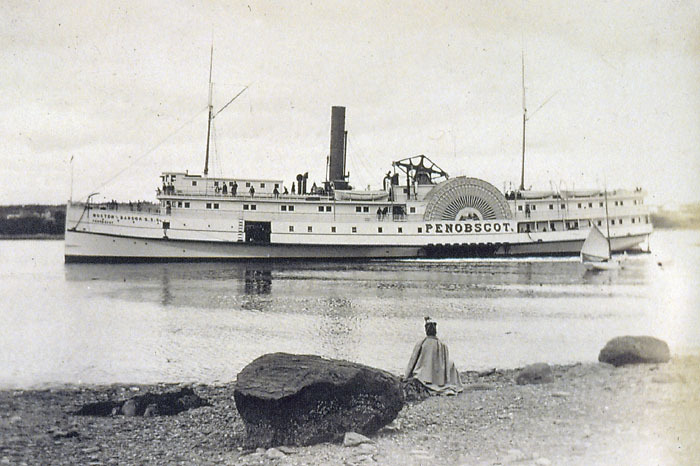 Steamer Penobscot entering Belfast harbor, on the Bangor to Boston route. 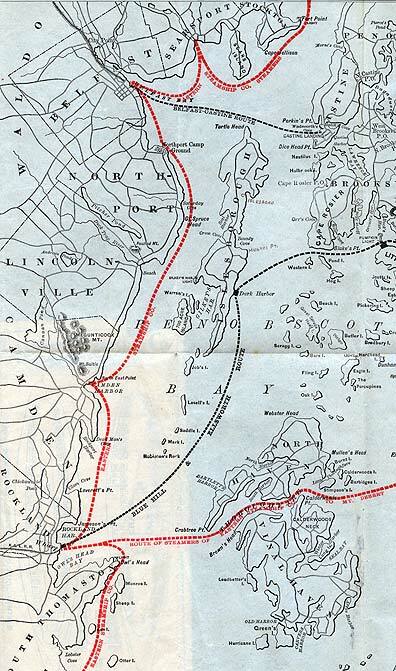 The reliable steamer Mount Desert operated on the Rockland to Mount Desert line from 1879 to 1904. This view may be from Stonington, as Mount Desert heads east towards Mount Desert Island and Frenchmans Bay. 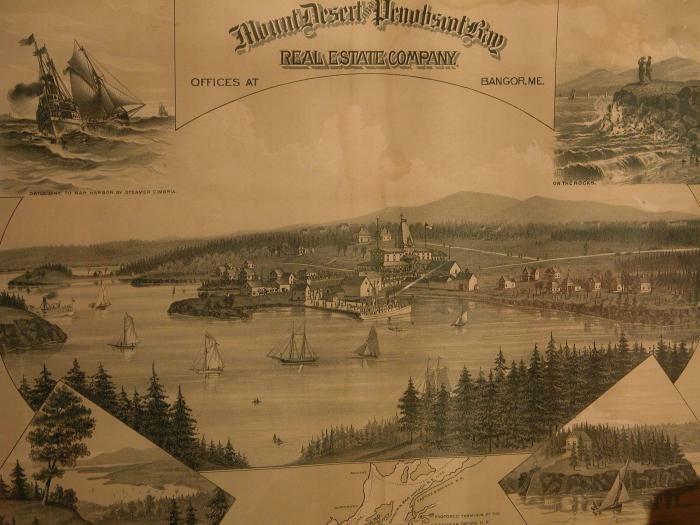 Real estate development for summer residents and tourists started in the last quarter of the nineteenth century as steamboats made travel from Boston easy. 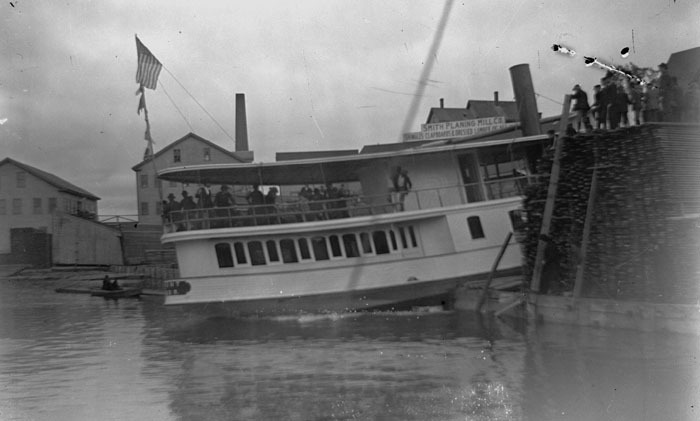 For the Penobscot bound, overnight boats from Boston stopped in Rockland by dawn after leaving Boston in the evening and were in Bangor by mid day. 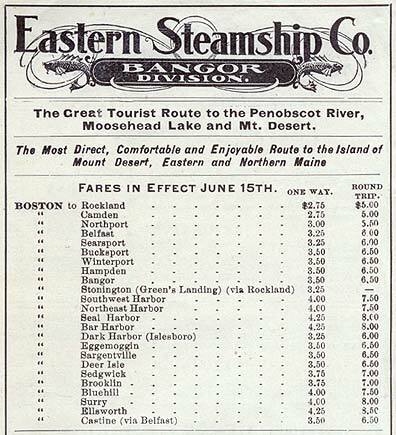 From the major Penobscot towns of the western shore, travelers transferred to smaller steamers for Mount Desert and smaller towns and islands. 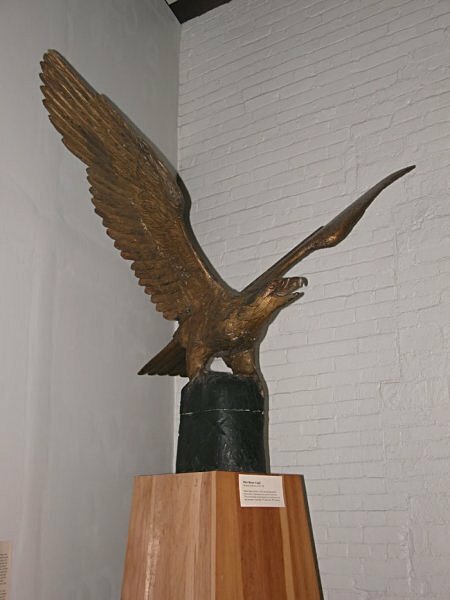 Carved wooden eagle, gilded, from the pilot house of a Penobscot Bay steamer. Eagles were the common carving found on the tops of steamboat pilot houses. 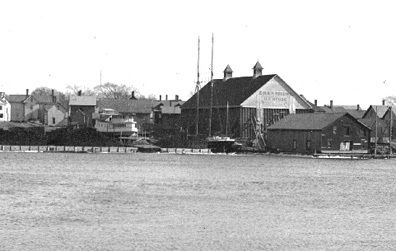 This shows the launching of the steamer Tremont at the Barbour Yard in Brewer in 1895. 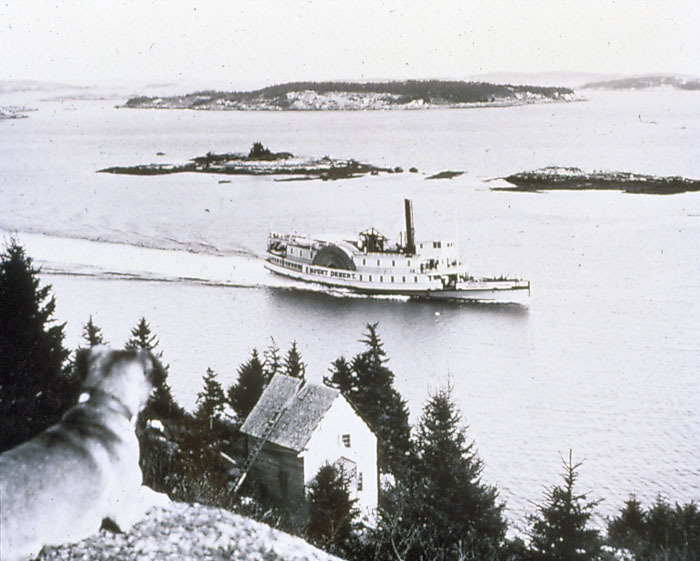 She sailed for the Bangor and Bar Harbor Steam Boat Company. The steamer Sedgwick was built at the Barbour Yard in Brewer in 1892, to carry passengers from Bangor to towns on the Eggemoggin Reach. 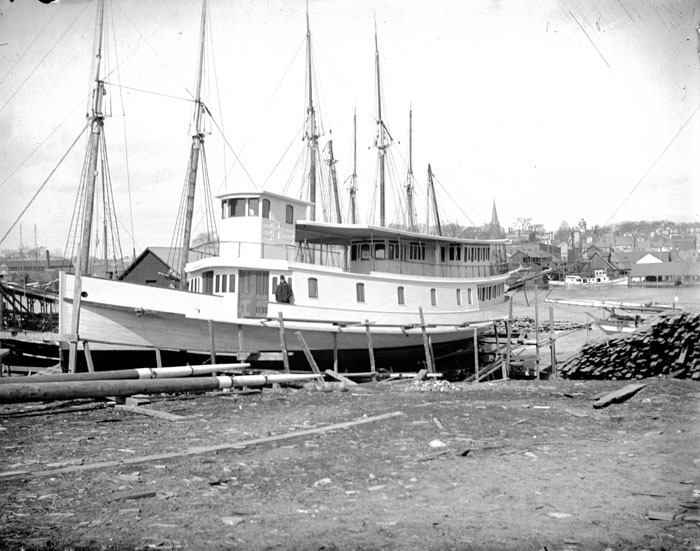 Barbour was one of few Penobscot Bay area shipbuilders to build steam vessels in the nineteenth century. The Brewer waterfront from the Bangor shore or from a boat in the Penobscot River. The large building to the right is an ice house. Next to it lies the Barbour shipyard with a steamboat, probably the Sedgwick under construction. 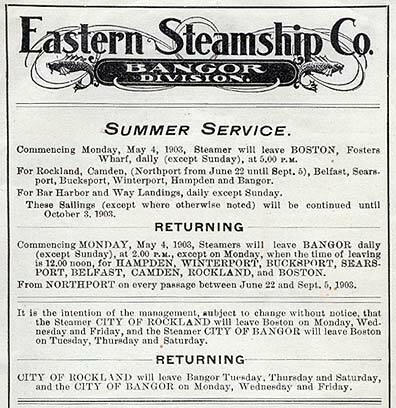 The Eastern Steamship Company's Bangor division 1903 brochure includes the schedule, fares, vessel layout, and a route map for the two steamships that sailed from Boston to Bangor, by way of Rockland, Camden, Belfast, Searsport, Winterport, and other Penobscot Bay and River ports on the way to and from Bangor. This was the summer schedule valid from May 4 to October 31, and it included stops in Northport from June 22 to September 5. With two boats, the City of Bangor and the City of Rockland, the company could provide daily service.